« What Does the Bible Say about Homosexuality? 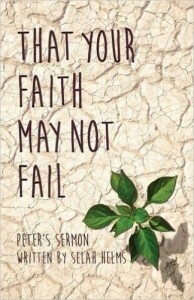 I am pleased to see that Selah Helms’ book, That Your Faith May Not Fail is now available. I was blessed to have an opportunity to read a pre-publication copy. Selah tells the story of her son’s tragic accident and how her family has walked through this trial. Having known, loved and respected the Helms for years, having watched them walk through this difficult time- and knowing that Selah is a good writer!- I knew this book would be good. But, it even exceeded my expectations. I was deeply moved, challenged and encouraged. I wept and longed for God more. So I commend this book to you heartily. It will be well worth your time. It has been a rich blessing for me and my family to know and love the Helms family. Since we first met their older two sons when they came to Union, the Helms became dear friends and helpful examples to us. This moving account of how they have and are walking through the ordeal of Peter’s suffering is truly powerful. I was challenged and encouraged by reading it. I found myself yearning to know God more richly, to trust Him more fully, to love my family more deeply, and to immerse myself more completely into God’s Word. 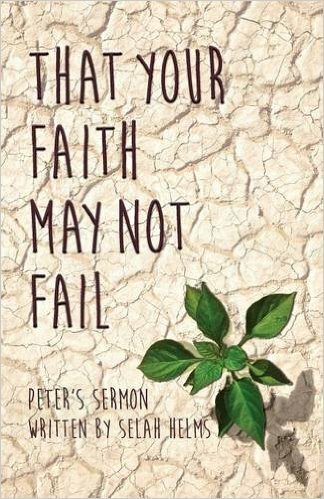 I urge you to read this book and pass it on to others because it will be useful in building up believers and calling people to faith in Jesus, as it recounts how this family has found God faithful as they have been held fast by the great gospel truths.